However, in this petition, Mr Abubakar claimed that the "true, actual and correct" results upon state by state computation pitched him as the winner in 21 states, excluding the results from Rivers State, which he said was not available on INEC's server as at February 25, when the computation was made. He, thus, claims that Mr Buhari only won the election in 15 states. Mr Abubakar said the "state to state computation" showed that he polled a total of 18,356,732 votes to defeat Mr Buhari whom he said scored 16,741,430 votes. "The 1st Respondent wrongly and unlawfully credited the 2nd Respondent with votes which were not valid or lawful votes at various stages of the election, namely, at the polling units, the ward collating centres, local government collating centres and the State collating centres, with the result that the 2nd Respondent was wrongly returned when the said 2nd Respondent did not score majority of lawful votes," he wrote. "The Petitioners shall also call evidence of statisticians forensic examiners and finger-print experts at the hearing of the Petition to establish that the scores credited the 2nd Respondent were not the product of actual votes validly cast at the polling units. The Petitioners plead and shall rely on electronic video recordings, newspaper reports, photographs and photographic images of several infractions of the electoral process by the Respondents. "The Petitioners plead, state and contend that from the data in the 1st Respondent's Server, as between the 1st Petitioner and the 2nd Respondent, the true, actual and correct results upon a State to State computation are as reflected under the scores of the1st Petitioner and the 2nd Respondent," he added. The APC has since reacted to Mr Abubakar's petition saying he and the PDP were suffering from hallucinations after the election defeat. 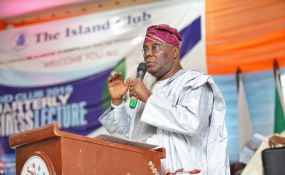 "Judging by Atiku and PDP's recent utterances and actions, it is now clear that they have slipped into severe depression and post-defeat hallucination that have left many Nigerians questioning their current state of mind," the ruling party said in a statement on Wednesday.